A research team from the NUST MISIS Laboratory of Superconducting Metamaterials led by Alexey Basharin, Senior Lecturer and Candidate of Technical Sciences, has developed a metamaterial-dielectric that has unique characteristics and is easy to manufacture. This ease of access will allow researchers to use it to create the latest optical devices. The research results were published in Laser&Photonics Reviews. Anapole is a non-emitting diffuser transparent to electromagnetic radiation. In 2017, a research team from the Laboratory of Superconducting Metamaterials and their colleagues from the University of Crete (Heraklion) established that anapole is an ideal resonator. When irradiated from the outside, anapole retains all the energy inside itself, while the electromagnetic oscillations fade very slowly. Compared to metallic metamaterials, dielectric metamaterials are more promising as they do not heat under exposure to electromagnetic radiation, which minimizes their energy dispersion. Every dielectric metamaterial can even be used in the optical spectrum to control its resonance. The research team's work demonstrates a promising new direction in the development of metamaterials. Previously, dielectric metamaterials were manufactured by the fabrication of complex dielectric (spherical or cylindrical) nanoparticles or by the deposition of various nanolayers. 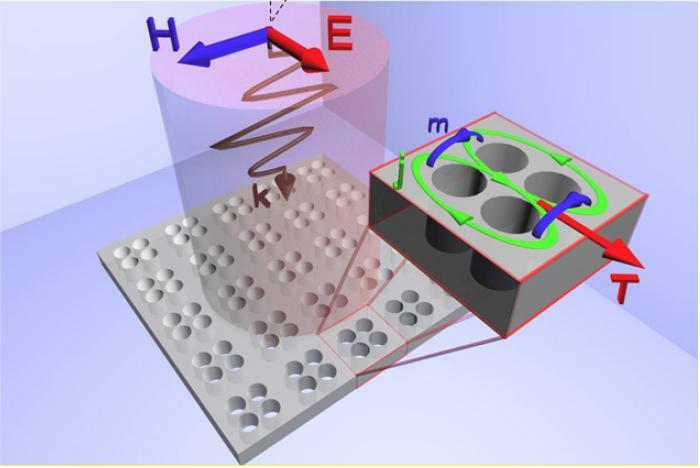 However, the research team from the Laboratory of Superconducting Metamaterials has shown that metamaterials can be manufactured by perforating holes in the thin film of silicon or other dielectrics. One of the easiest ways to do this is to use a FIB beam – a focused ion beam that create holes up to 5 nm large. &laquoIn the theoretical part of the experiment, we were able to show that in the optical frequency range it will be possible to excite a special anapole condition which is promising for the strong localization of electromagnetic fields, as well as sensors. In addition, we have found that these metamaterials can be transparent to electromagnetic waves, which in real experiments with silicon should show the evidence of our technique and significantly increase the transparency of silicon plates, for example, for use in solar batteries», said Alexey Basharin, head of the project. The scientists suggest that this new metamaterial can be used in silicon nanooptics and solar cells. Work on the experimental part of the study is currently continuing with RAS and international partners. &laquoThe scientific work of the research team from the NUST MISIS Laboratory of Superconducting Metamaterials led by Senior Lecturer Alexey Basharin, Candidate of Technical Sciences [has been] published in a scientific journal with an impact factor of 8.5. This is a bright example and proof of NUST MISISs students and stature [in the scientific community]. PhD student Anar Ospanov and Masters degree student Ivan Stenischev, who participated in the study with an academic supervisor, are now listed among the authors of the paper», – said Alevtina Chernikova, Rector of NUST MISIS.